I commented on a re-blog, Here’s an Idea that Mimi‘s post coincided a PBS show about a branch of neuroscience called Contemplative Mindfulness. Rudolph Tanzi is central in this work which has grown from other recent research by Richard Davidson, Ellen Langer, and Jon Kabat-Zinn. Mindful practices have been with us for centuries and are found in Christ’s, the Buddha’s and Mohammed’s teachings. Mindful listening begins with me, moves outward, and is eloquently described by Hafiz, a Sufi poet. 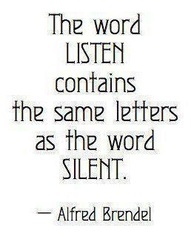 Mindful listening requires humility those teachers emulated in their lived practice as the servant as leader. Posted in Community, Leadership, Mindful Life, Poetry, Reflective Moments, Sabbath and tagged conversational journey, eloquent questions, Hafiz, mindful listening, Mindful Practice, poetry, servant-leadership, spirituality, sufi poet, teacher as transformer. Bookmark the permalink.